There were many things that were awesome about this past weekend, which I will write about later. 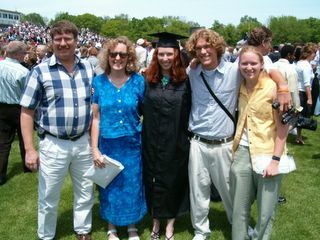 But for now I will cover what happened that seemed to overshadow my graduation day. It starts on Friday night, the day before graduation. I realized after I had been dropped off at Taylor for the evening that I left my cap and gown in my parent’s car, and they were on their way to Indy. I called them and they were about 20 minutes away. They didn’t want to turn around; after a bit of “discussion” they convinced me that it would be okay if they just brought my cap and gown the morning of graduation. I didn’t like it, but I had no other options. Of course it will be okay, I told myself. What could go wrong? Saturday morning when I arrived on campus I called them to ask where they were. “We’ll get there when we get there,” was all my mom said. I was immediately concerned. It took awile but I finally got them to tell me the truth: they had hit a deer on their way up to Taylor. The whole hour before graduation I was on the verge of tears. How could I be there as the only person not in a cap and gown? I was told I could borrow a faculty robe with the velvet stripes on the side, but I still had no cap or tassle. I didn’t want to look different than everyone else. I was upset. Meanwhile, my parents had gotten someone to pick them up and take them to Taylor – speeding the whole way. Five minutes before all the graduates left the Kesler Center to walk onto the field, I saw Paul come running in with my robe. I was shaking like crazying out of tension, but I managed to robe myself and put the cap on straight. The rest of graduation went smoothly but I was really shaken up. After the close call with the cap and gown, I started thinking about other things – who had been driving? If the car was undriveable, were we stuck in Indiana longer than we meant to? By the end of the ceremony, I was calm enough to smile and chat with people. It wasn’t until we were on our way home that I found out my dad had missed my entire graduation trying to get a new windshield for the van. 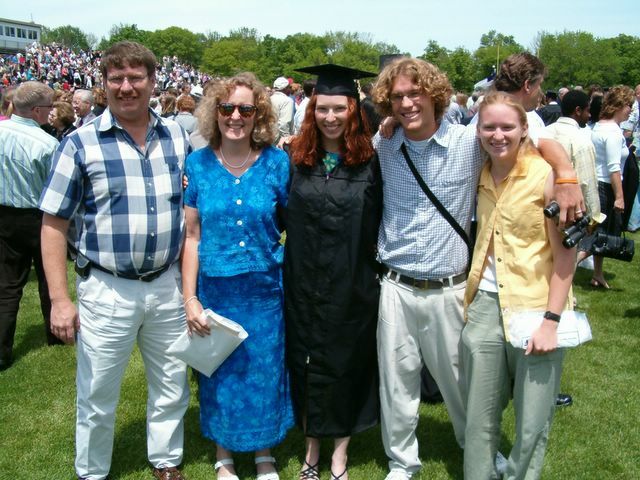 My dad – who had taken three days off work and drove a total 41 hours in five days to watch his oldest daughter graduate from his alma mater – completely missed the entire ceremony. That made me really sad. With a new windshield and missing the essential left side mirror of the van, we went to a friend’s house in Marion to vaccuum out the car for the third time. There was so much glass everywhere. We finally left Marion around 5 pm (Atlanta time) and arrived to my apartment at 4 am. It was a long drive and at the beginning tensions were high. But we made it and everyone is home now. I think I am finally calming down about the cap and gown thing – I had to force myself to not think about the “what if” because in reality, I got my gown and it was okay in the end.